Kitzbühel, or Kitzbüehel in German, is arguably Austria’s most beautiful alpine ski resort, its authentic, historic and charming, and ideal for family ski holiday. This medieval silver mining village sits in the valley between three ski-able mountain peaks, making it a gold mine for skiers. Skiing began here in 1893 thanks to a brave Austrian Franz Reisch, who climbed to the summit of the Kitzbüheler Horn and descended on wooden skis from Norway. Now Kitzbühel’s ski fame continues hosting the biggest ski race in the world, the Hahnenkamm Downhill held on the Strief trail every January. Beyond its alpine racing legend, Kitzbühel is one of the best ski villages for family ski holiday in Austria. Kitzbühel is moderate in elevation for the Alps, just 2,000 meters (6,561’), but the ski slopes are grassy, requiring less natural snow. 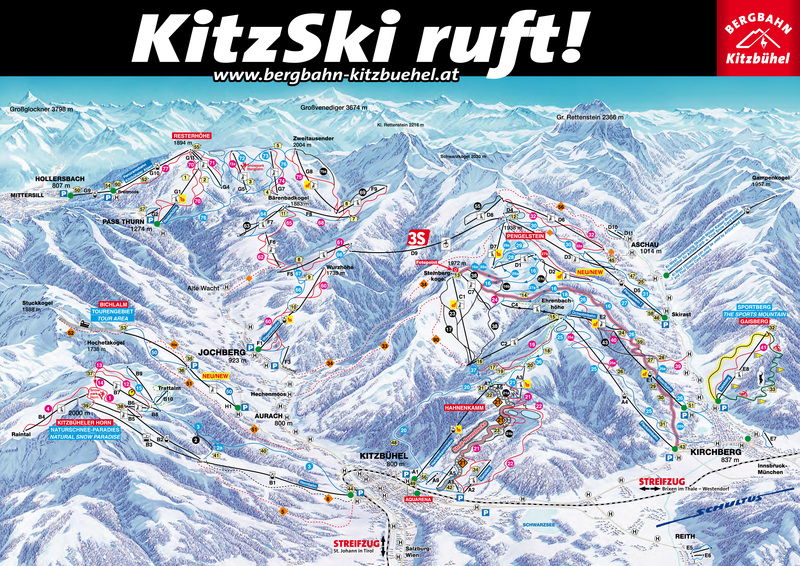 In fact Kitzbühel is typically the first non-glacier ski resort top open in Austria, behind Stubaier and Hintertux – which is open year round. Kitzbühel’s skiing is huge, with 54 cable cars and lifts, 209 km of well-groomed slopes on three peak. There is so much to Kitzbühel skiing, 60 marked trails that are groomed daily (170 kilometers) with a hyper efficient lift system of 54 cable cars – eight and six passenger chairs with heated seats at every turn, and grand gondolas. 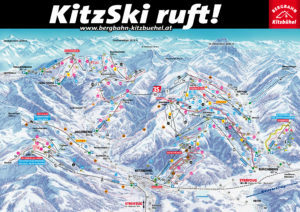 Kitzbühel has invested heavily in lifts and snowmaking. Besides all the well-prepared ski terrain, there is limitless “off-piste” just off the prepared runs, easy to reach and get back to the trails and lifts. 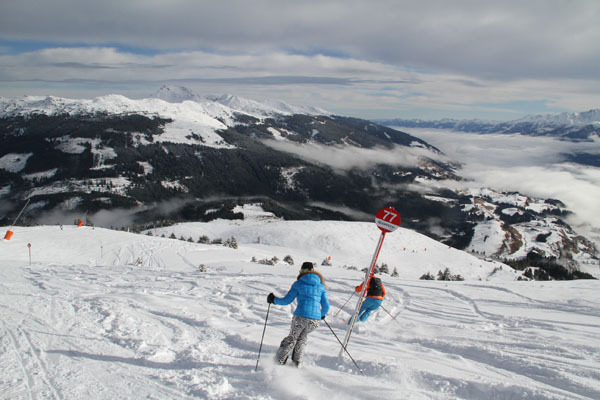 If you can see you can ski it, but be cautious and hire a guide – we suggest Alpin Experts. 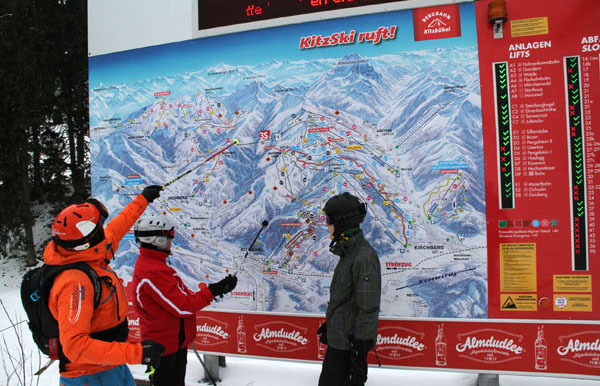 Kitzbühel has 22 ski schools, catering to kindergarten age on up to experts. Kitzbühel on mountain dining and après ski is famous for it good reason, 56 ski chalets dot the mountain slopes – these ski in ski out huts are independently owned and hosted by families who farm the alpine slopes with their cows in the summer. 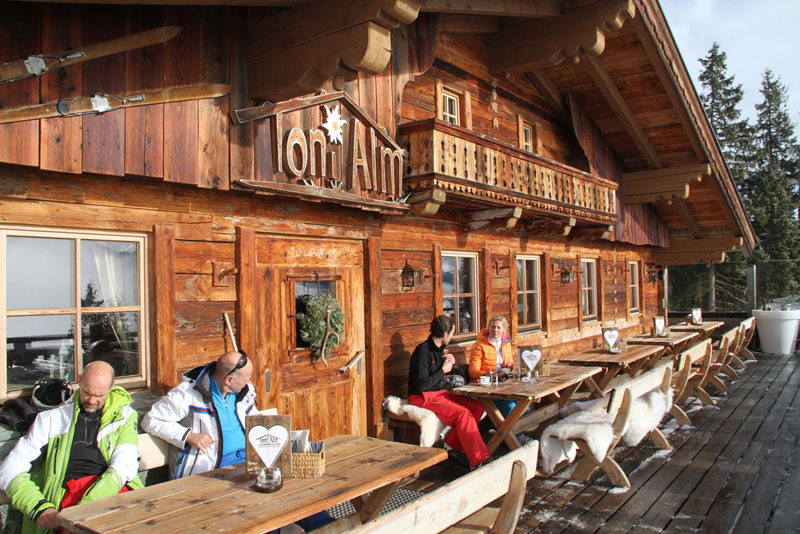 Ski in for homemade lunch, a café or cocoa, or schnapps at these delightful spots, most have sun decks for those beautiful blue sky days and music playing. We enjoyed lunch at Toni Alm skiing to Jochberg near the town of Mittersill in neighboring Salzburg County, the furthest south of Kitzbühel’s ski terrain. 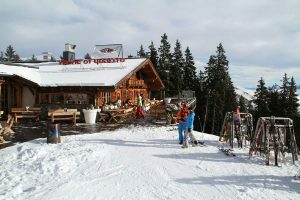 Also the classic chalet Barenbad has the best goulash soup in a cozy bar, both are reached by the 3s Gondola – an 8-minute ride across the valley (an amazing lift connecting Jochburg to Hahnenkamm peak. If you have non-skiers in your family, meet at the lodge atop the Hahnekamm Gondola and race course, this beautiful panoramic lodge is popular for après ski on Saturdays. 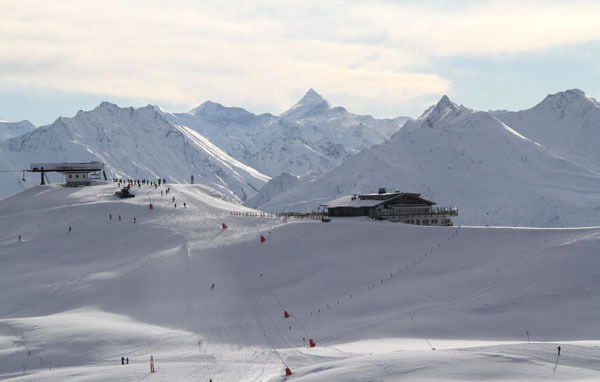 Kitzbüheler Horn is a separate ski area, across town with more lifts, terrain parks, perfect for family skiing, currently being upgraded with snowmaking. 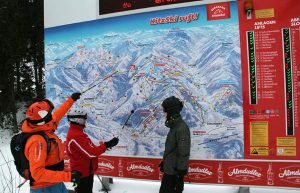 Kitzbühel was the first Alps ski resort to market a Ski Safari, a circuit to ski the entire region- 100 kilometers reaching nearby SkiWelt, this ski circuit concept has since been emulated by the Dolomite’s Sella Ronda among others. You must ski the Hahnenkamm at Kitzbühel, the steep exciting race course that hosts the world’s best downhill racers and 100,000 fans each January. The Family Streif is a race run designed so everyone can experienced the World Cup race course, but skirt around the extremely steep part of the downhill course, the “Hausbergkante” still ending at the Seidlalm finish line. Kitzbühel’s 8,000 residents welcome visitors with open arms and genuine hospitality while preserving their authentic alpine village. Kitzbühel has 4 and 5 star hotels, we recommend four-star Hotel Rasmushof -with its indoor pool and prime location right at the Hahnenkamm finish line – an easy walk to the gondola and town. Kitzbühel offers fun après ski including sledding, skating, horse drawn carriage rides, exploring Legends Park, and the pedestrian cobblestone streets of Kitzbühel, now lined with very chic boutiques and après ski bars. Kitzbühel is easy to reach from Innsbruck, two from Munich , and also close to nearby ski resorts SkiWelt and Ski Juwel in the Kitzbühel Valley. Summit Elevation 6,561’, Base 2,624’, Vertical 3,337’, 1112 ski able acres, 54 lifts, longest run 5 miles, 106 miles of trails, home of the world famous downhill run – The Streif – host of the Hahnenkamm race.